With Christmas parties in full swing, here's some light relief. How many of these 'guests' do you recognise? This is the guy who normally only gets exercise when the TV remote is broken, but thinks he can show the youngsters how to do the twist. Half way through, his face is so red that you can reduce your lighting by half! How to spot: wears trousers that will only button under his beer gut, sits near the bar so he doesn't have to walk far, has to be carried out at the end of the night! The tearaway, hyperactive kid. He runs riot at the venue, knocking things over, getting under your feet and sliding across the dance floor on his knees. How to spot: look for three 6's under his hairline. This is the outcast - once he's found someone who will talk to him (ie you) he's there for the night. How to spot: unfortunately by the time you realise it’s a "Larry" it's too late because you've already said 'Hello'. This is the guy who's just topping up from the night before. "The music's too loud, the lights flash too much, you haven't played any Bay City Rollers etc"
How to spot: He stands at your shoulder telling you what to play until you tell him politely to go & enjoy himself or introduce him to Larry/Derek. She lies in the middle of the dance floor and screams loud enough to set off the noise limiter just because you wouldn’t play her song immediately. How to spot: not hard, just follow the screams. May also be called Kylie, Naomi, Cheryl or any other name that was fashionable when she was born. This is the guy who insists on standing right in front of you and talking whilst you're using the mic. He then tries to wrestle the mic from you because he wants to mumble a few words. How to spot: well you can't miss him because he's in your face. Give him a broken/inflatable mic and send him on his way. His first words will be "I'm a DJ too". He will know the ideal track to fill the dance floor, although its already heaving at this point. He'll badger you all night for "a go" as probably the only thing he usually has had in front of him is the bedroom wall. How to spot: Difficult not to, he's normally got your headphones on when you turn back. The person whose party it is 'specifically' invited him so that he could sing "Wonderwall". Strangely enough.....your client is blissfully unaware of this previous conversation. How to spot: Keeps eyes transfixed on your mic while trying to make a crafty grab for it....and thats before he introduces himself. Its the bride and grooms first dance. Subtle colours wash the dance floor with delicate lighting from a cluster laser when ....WHAPP!!! Enough lights are turned on to drain the National grid. All you can see on the dance floor are 3 silhouetted shapes, the bride and groom ... and Vince. How to spot: commandeers all the plug sockets in the room for charging his equipment forcing you to run a 10m extension from another room. Dave is the one that seeks out and installs himself bang in the middle of the only feasible exit for that room. After numerous "excuse me"s, he tilts his large frame slightly to one side. How to spot: It required a site visit for you to determine the best access; Dave finds it by pure instinct. Samantha is always outside having a cigarette when you play her favourite songs, so you 'must' play them again. How to spot: Very hard to spot, as she's hardly ever in the room. You've announced there is only an hour left, then last orders and the final song.......when Tina appears with a request and can't understand why you're not able to play it. How to spot: You don't see her all evening, but she'll be at your side when there's one minute to go. She is polite, spends most of the night on the dance floor and congratulates you at the end for a job well done. How to spot: sadly this species is in decline so if you do come across one treat with respect and invite her to all your other events. *Full terms can be found here. PLI underwritten by Royal & Sun Alliance. Why not check out the benefits of joining AMPdj (including our PLI policy) 1st and then decide? This is not just a short term price offer to get you in. Yes, we could easily charge more for membership of AMPdj so, if £49 is too low for you, then you could always make us an offer before you consider going elsewhere! You can also opt (as some have) to include more areas with your membership = more enquiries. Our sites are doing extremely well with the search engines with many of our designated search terms now giving us a top 10 organic position! 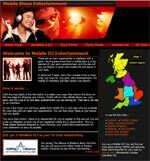 We've also fully revamped one of our sites to bring in even more client enquiries for our members. "Does the PLI cover things like bubble and snow machines?" "This is fine as long as it is only ancillary to the DJing performance." Please get in touch. Either by email or give us a call. Our number is 0333 577 2247(Calls charged at normal landline rate and included in applicable call/bundle packages). It's always good to hear from you. Want future Infomails delivered direct to your inbox? Subscribe.